Dr. John P Fang, MD is a Doctor primarily located in Ventura, CA. He has 18 years of experience. His specialties include Ophthalmology. He speaks English. The overall average patient rating of Dr. John P Fang is Great. Dr. John P Fang has been rated by 11 patients. From those 11 patients 3 of those left a comment along with their rating. The overall rating for Dr. John P Fang is 3.7 of 5.0 stars. No testing regarding possible melanoma. Should of done testing besides telling me " i don't think you have eye cancer " . What is that suppossed to mean !!!? Did not answer my questions . Dr. Fang is a great doctor that does a good job of explaining conditions to patients. He has a good bedside manner and I would recommend him highly to anyone. Dr. John Fang is an outstanding doctor! I have been a patient of Dr. Fang for about three years, and I have finally found a "caring" ophthalmologist in Lawton. Dr. Fang immediately puts me at ease during visits. I do not like having my eyes dilated or having bright lights aimed at them - but for some reason with him in the office I'm able to deal with this. Dr. Fang cares about his patients. He always remembers what my problems were - things that I'm sure are not in my file. Lawton is fortunately to have an ophthamologist the calibre of Dr. John Fang. 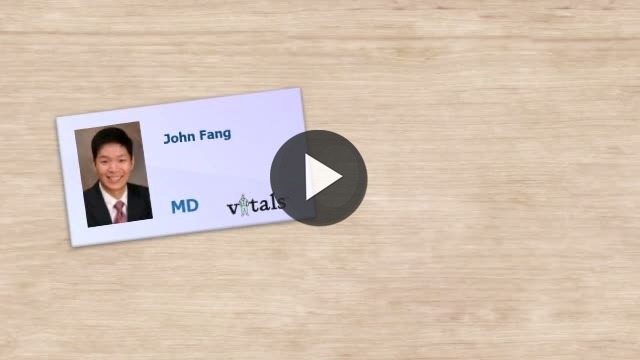 Take a minute to learn about Dr. John P Fang, MD - Ophthalmology in Ventura, CA, in this video. Dr. John P Fang is similar to the following 4 Doctors near Ventura, CA. Have you had a recent visit with Dr. John P Fang? Select a star to let us know how it was.